Bangkok Diary Thursday 14 October 2010: Apple Media Event 20 October - OS X, Lion? Press invitations have been sent out to several members of the media for an Apple event to be held next week on 20 October at Apple's Town Hall on the Cupertino Campus -- 1 Infinity Loop -- which is two days after the latest Quarterly figures are to be reported. Apple is looking forward to a good week. The invitation is typical Apple in that it has a brief sentence as part of the email below an image. That image is here. With the title, Back to the Mac, we can be fairly sure this is an event that will not see an iPhone, iPad or iPod and will focus on what is still the core business of Cupertino. We note that with 10.6% of sales it was announced this week that Apple is now number 3 PC seller in the USA. The sentence that completes the invitation is . . .
Come see what's new for the Mac on October 20, including a sneak peek of the next major version of Mac OS X. We are clearly told in the second part of that sentence that OS X is to be previewed and 10.7 should be no surprise. What is unknown is the name. We are currently on 10.6 Snow Leopard, which was released in August 2009, and have run through most of the big cats. 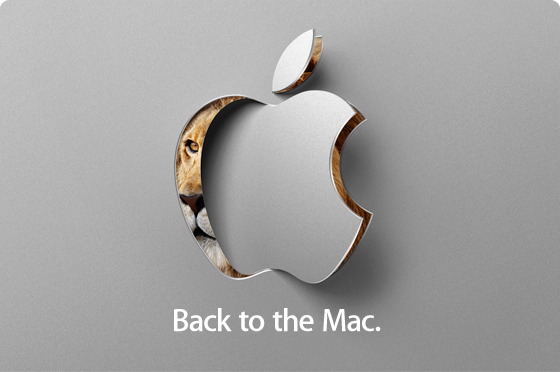 The image makes it fairly easy to speculate that the next version of OS X is to be called, Lion. Or not. There are lots of guessing games going on right now as with all of Apple's teaser invitations, but I think we are on fairly safe ground here, unless it is some sophisticated in-joke on battery technology. Let's stick with Lion, at least for now. iLife: This has been mentioned a number of times in the last few weeks, including the dropping of iDVD and the addition of another web-centric component as yet unannounced. One wonders if the success of Facetime on the iPhone 4 could be incorporated into a new iChat, or even if iChat would be replaced. It is high time it worked easily with other systems, especially the MSN online chat system. Aperture was updated to 64-bit a while back, so this could also be another part of any iLife update. MacBook Air: This is long overdue for an update and some have been suggesting a smaller screen size of 11.6", making it more portable. This would also make it less competitive with the MacBook and MacBook Pro. iMac: This is about ready for an update, although whether the rumoured touch screen versions would be ready as yet (there was a patent for this filed in the UK in January this year), may be doubtful. Nonetheless, a different screen, a different processor would be useful to keep this popular Mac on the boil. MacBook: While the MacBook Pro was updated not so long ago in the early part of this year, the MacBook has been a bit static, so there could be a change offered here with different processors. As this is an immensely popular computer, especially with students and schools, Apple might not want to tamper too much with it, although Dan Ackerman and Scott Stein at CNET suggest the SD card would be a safe addition. Mac Pro: Although updated not so long ago, this is the workhorse and much loved by those who demand power for major tasks: movie makers may buy these by the score. Video and processor enhancements are always welcome here.